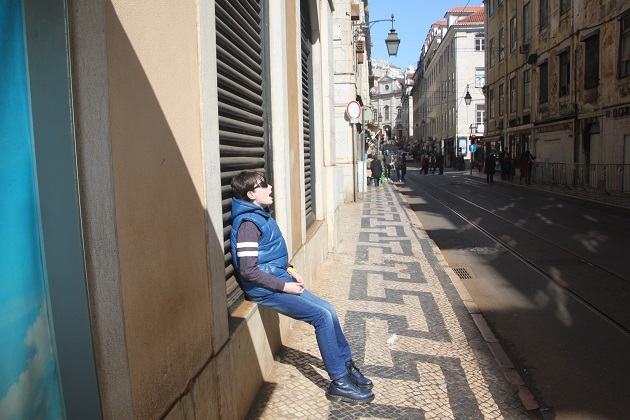 On our first day in Lisbon we got to our hotel, got rid of our suitcases and after a quick lunch decided to make Tram 28 our first adventure in the city. We spotted the yellow trams in the city streets and easily found a tram stop. 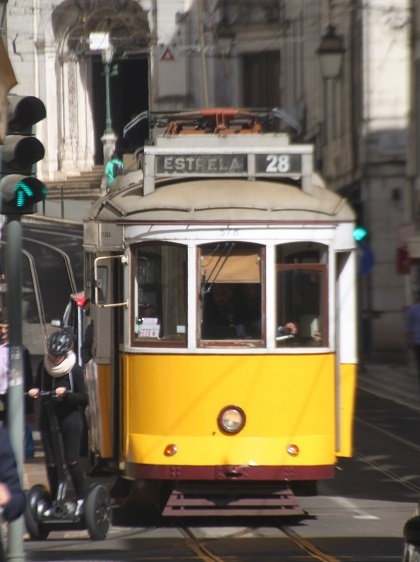 Tram 28 is one of three traditional tram lines that still operate in Lisbon. It winds its way through the old town and takes you past many of the city’s famous and interesting sights and across four of the seven hills upon which the city is built. We have trams in our city and ride them often but they are nothing like these vintage beauties. All wooden inside and just stunning, you enter at the front and exit at the rear. Sounds easy but it is no mean feat when they are completely packed. We joined the mega line at the tram stop and (some of us) waited patiently to get on. Son did not fit into that category. A couple of trams passed us by, full up to capacity they obviously could not squeeze one more person on board and did not even bother to stop and try. Eventually one tram (still packed) did stop and we all crammed onto it. We bought Via Viagem unlimited 24 hour passes which cost 6 Euro and included all trams, buses and the metro. You could though buy a ticket for this tram from the driver. Getting on was a bit of an experience. Everyone lined up in an orderly fashion, until that is the tram arrived. Then masses of people descended from all directions and elbowed you out of the way. Son sussed it all out pretty quickly and became a dab hand at the pushing and shoving thing – we just followed him. Lots of signs inside warning of pickpockets meant we held on tightly to our belongings. A couple of stops later most people actually got off, we finally managed to snag seats and started to be able to appreciate the views. The tram ride was noisy, hilly and hectic but gave us beautiful glimpses of the city and was lots of fun. The bell rang a lot to alert people and traffic to the tram’s presence and there were frequent stops. We rattled and clanked our way up and down the hills – at breakneck speed sometimes. It felt a little like a rollercoaster as we zoomed through the narrowest of streets. Our driver added a bit of extra excitement into the mix by frequently yelling and shouting abuse at cars getting in the way – sometimes this got more than a little heated. He did the same with pedestrians and people on the street too. I can safely say there was not a dull moment on Tram 28 and this is most definitely a unique experience. Getting off the tram was quite the achievement too – we discovered it is necessary to elbow your way to the back and jump out pretty promptly. The driver does not hang around. An adventure for sure and a Lisbon must. Brings back wonderful memories of Lisbon. Great post! It’s such a fun and different thing to do! You are really teasing me now and it is still four months until we visit Lisbon. Where did you buy the travel passes? You buy them from the metro stations, we tried the automatic machines but failed miserably and ended up buying them from the ticket office. They work really well, especially if you plan a couple of days where you use lots of public transport – they also work for the Santa Justa elevator. 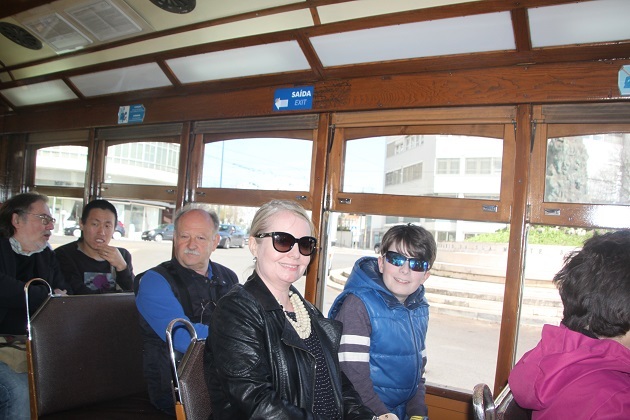 The trams are gorgeous and it was such a fun experience rattling through those streets Suzanne. Glad you enjoyed it too. 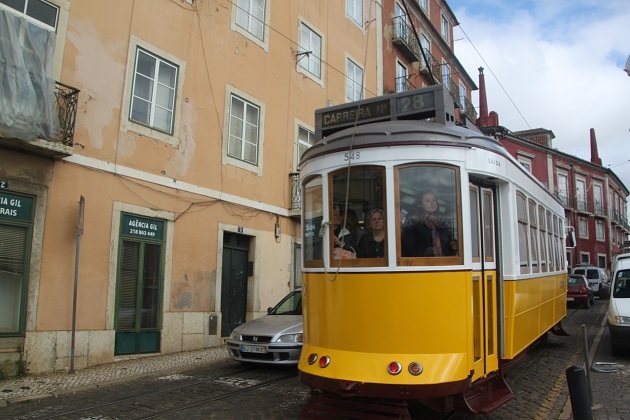 We enjoyed riding this tram too, so much fun to see the streets of Lisbon rattling round on those trams with their lovely polished wooden seats. They really are beauties, inside and out. It was such a fun thing to do, the speed sometimes was incredible in the narrow streets and our hot headed driver was the icing on the cake! As long as you got off in one piece is all that matters, the journey adds to the fun and so different from the sleek Manchester trams we are so used to! You just take a breath, push through and go for it!! All part of the experience though Kelly and loads of fun – I highly recommend! We had a bit of the complaining about the wait!! However once we got onboard everyone was happy. They are gorgeous though and I couldn’t help but stop and watch most times I saw one. Oh boy, I’ll have to mentally prepare for this adventure 🙂 Not a fan of crowds! Me neither and it was pretty packed when we got on board. However a couple of stops later and the tram was mostly empty – like this for the rest of the ride too until we got back to Baixa. That’s exactly what it was like Tanja and we loved the thrill of it all. I saw a man get pickpocketed on this tram. The guys held him back to let me on first jostled him a bit and then threw his empty wallet back on about 100 meters later. And the driver had to be in on it too. We had read so much about pickpockets on the tram so were on heightened alert. Not much you can do though if they do decide to target you – this happened to us getting on a train in Paris with a similar jostling thing – we didn’t see anything in Lisbon so were lucky. Sounds a lot of fun Joy and quite an adventure at the same time – you certainly need to have your wits abut you by the sound of it! Absolutely true Rosemary, not for the faint hearted for sure!! We saw a couple of little old ladies and I have no idea quite how they managed – getting off in particular required nerves of steel. We did love it though. Joy, the tram ride was definitely an experience, it seems! The pushing and shoving makes me think of subways! Lisbon is definitely on my list! 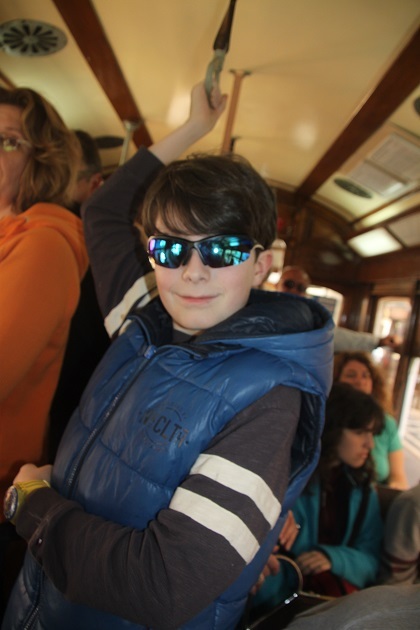 It is a wonderful city – I am sure you would love it Pam and this tram ride is like no other!! Such a lot of fun and different to any other I’ve ever experienced. We love trams! Such a fun way of exploring a city. Sounds like there was a lot of action, including with the driver, on this one! The driver was more than a bit hot headed – once we got over the shock (we don’t see drivers like this here!) it was so much fun and really added to the experience. This was a tram ride like no other – thrills and spills like a fairground ride with a hot headed driver made for a very exciting ride. We just loved it! I love reading this. So amazing! Thanks for sharing. We are getting ready for a trip in August and love seeing what you guys are doing! It is helpful because we are looking to go to Portugal and it looks very family friendly. Oh it really is family friendly and such a great country to bring children – our son really enjoyed himself. Still sorting out photos and plenty more blog posts to come about our visit to Lisbon – hope it is helpful!! You must be excited about your trip already!! I’m guessing that sitting near the tram operator was an experience in itself? Absolutely George, we don’t have tram drivers like that here!! He was a hot head for sure but rather entertaining! Hi, I have enjoyed reading about your adventures in Lisbon. I liked the fact you just loved every thing about the city. Pity about the pickpockets though. Thank you Margaret. It is a great city with so much to see and do – we really loved exploring. Luckily we didn’t have any experiences with pickpockets but were just careful. It is a real shame but seems like something you have to watch out for everywhere nowadays. What an experience! We didn’t manage to catch a tram (gave up after about 5 full ones passed us by) but it sounds like a lot of fun! They are so popular, we had some pass us by and were on the verge of giving up when this one stopped and we crammed on board. A couple of stops later and it was virtually empty again so I think it definitely makes a difference just where you get on. It was loads of fun though, very different to any other tram ride I’ve been on! This one was so much fun, so different and really quite exciting! The trams are gorgeous too both inside and out. 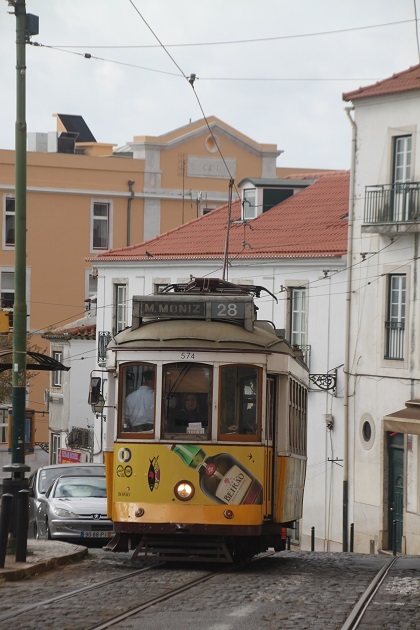 Trams scare me a little bit (particularly the one in Wimbledon…I haven’t taken it since it derailed last year and killed 7 passengers, but that’s an extreme example), and the Lisbon one sounds quite scary, but also fun! I just wouldn’t want to be a pedestrian who got in the way! That was really horrendous and definitely off-putting. We have trams in Manchester and ride them but the route we take they tend not to be able to go very fast. 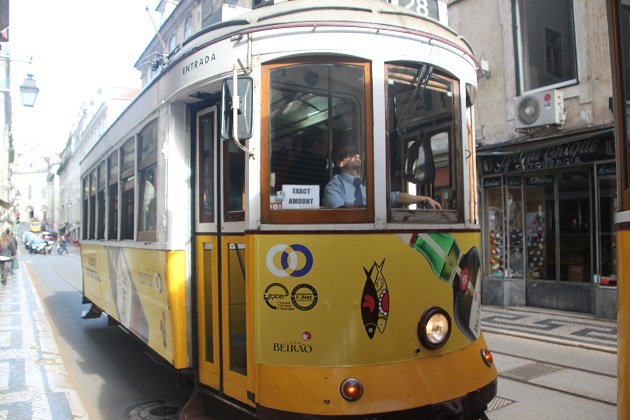 The Lisbon tram was definitely a thrill ride but we loved it. It was useful to ride it on our first day, as pedestrians ourselves after that we made sure to get out of the way fast! 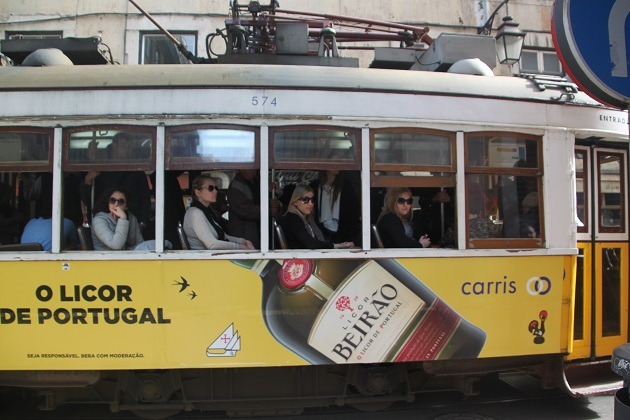 Oh I didn’t know trams were still popular in Lisbon! Last time I took a tram was in Budapest a few years ago. This tram ride is so much fun and a real experience – a hot headed driver and some narrow streets makes for a real thrill ride.